I am in the Tweed Museum of Art on my campus, standing before a photograph by the Minnesota artist Vance Gellert, labeled Petroglyphs, Spirit Island, Nett Lake. Nett Lake is on the Bois Fort Reservation of the Lake Superior Ojibwe. Spirit Island is not the largest island in Nett Lake, but it is the most sacred. In the foreground of the photograph, there is a smoothed outcrop of Archean migmatite which forms part of the shore of the island. Migmatite is a metamorphosed rock formed about 2.7 billion years ago when tectonic forces deep within the earth raised blobs of granitic magma across what is now northern Minnesota and northwestern Ontario. The magma intruded into the overlying layers of sedimentary rocks, partially melting and then folding them again and again, as if it were kneading bread. There are many petroglyphs (rock carvings) on the smoothed surface of the outcrop (rock paintings are petrographs). The major motif in the petroglyphs is of a man with oversized outstretched hands, a motif common in petroglyphs and petrographs in the region. The carved man may be a representation of the Manidoo, or Great Spirit who has resided on the island since creation. There are also carvings of a fish (a sturgeon? ), a dog or wolf, and various abstract dots and lines. About 50 feet further along the crest of the outcrop, a man stands facing out across the lake, his hands in his pockets and his back to us. The man is a member of the Bois Fort Band of Ojibwe. 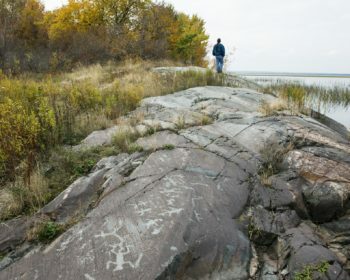 The petroglyphs may have been sculpted long before the man’s Ojibwe ancestors arrived from the east. What the photograph’s label does not tell us is that the rock outcrop had a previous sculptor about 18,000 years ago: the Rainy Lobe of the Laurentide Ice Sheet. As the ice sheet flowed over the outcrop from northeast to southwest over thousands of years, the sand and clay embedded beneath it molded and polished the hard rock of the outcrop. Its current streamlined form rises slowly and gracefully from the surrounding earth, arches where the man is standing, and just as gracefully but a bit more steeply descends back into the earth in front of the man. It looks like the frozen back of a whale beginning to sound into the depths of the sea, just before its flukes flip skyward out of the water. A whale’s back. To a geologist, a whaleback. Parallel grooves and scratches, known as striations, are embedded into the surface of the whaleback, pointing along the direction of flow down the long axis of the outcrop wherever the ice sheet dragged a pebble along like a chisel. Was the artist of the petroglyphs aware that this outcrop had been shaped by larger forces long ago? Impossible to say for sure. Many of the petroglyphs are lined up along the striations, as if the artist was using the outcrop as one would write on lined paper. But some, especially the ones nearest us, are at odd angles to the scratches. Perhaps the outcrop just served as a convenient canvas. Or perhaps there were two artists plying their trades at different times, each with a different vision of the possibilities of the rock surface. Tectonic forces melted and folded the rock across much of what has become Minnesota and Ontario over 2 billion years ago. Eighteen thousand years ago, an ice sheet smoothed and polished an outcrop of the rock. Sometime during the past 1,000 years, humans carved images onto a small portion of the outcrop. The earth’s long history shaped this outcrop into its current form, each agent sculpting it at its own rate and time and at its own scale. The earth is a big sculpture floating in space, always changing, never finished. Gellert, V. 2016. Sleeping Giant. Exhibition Catalog. Available from: Tweed Museum of Art, University of Minnesota Duluth, Duluth, Minnesota. Jirsa, M.A., et al. 2011. Geologic Map of Minnesota: Bedrock Geology. Minnesota Geological Survey, University of Minnesota Press, Minneapolis, Minnesota. Ojakangas, R.W. and C.L. Matsch. 1982. Minnesota’s Geology. University of Minnesota Press, Minneapolis, Minnesota. Next Next post: What to do after last week?